The heart of Home Chef is all about the enjoyment of meal time at home. The company’s mantra is that ‘Home Chef brings people together around the dinner table’. They achieve this by delivering wonderful classic and well-known home cooked meals that often come with a twist. Home Chef delivers the best farm fresh ingredients for each meal, and it does so by partnering with many local and worldwide farms. The company was established in 2013, and today, Home Chef boasts an incredible coverage with over 10 million meals delivered in 2016 alone. The company caters to 97% of the US, and by using Home Chef you can be assured that you will reduce food waste, save time, and provide great-tasting meals to everyone. 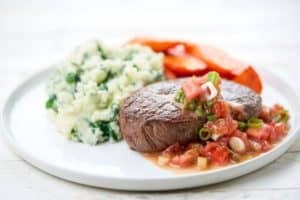 Home Chef is most suitable for singles, couples and families who are pressed for time but would still love to enjoy super delicious meals that are home cooked and take no longer than 30 minutes to prepare! With Home Chef you can enjoy a great deal of flexibility. They offer delivery for two, four or six people, with a minimum selection requirement of two dishes per week. With Home Chef there is no maximum limit! 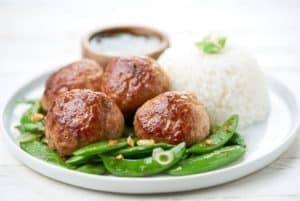 They also offer a nice selection of add ons – smoothies and fruit baskets at $4.95 each and a few quick ‘no-cooking required’ lunch options (salads, sandwiches and grain bowls), all offered at $7.99 per serving. 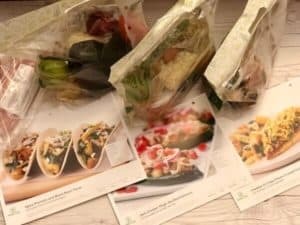 Getting started with Home Chef is super easy! All you need to do is to sign up to the service via their website or app. Then you simply choose which meals you would like to eat out of the 12 incredible weekly changing recipes. Once you have made your selections, you’ll receive all your meal kits in a securely insulated box. Next you unpack the ingredients, use the easy to follow recipes and that’s it! All you need to do then, is to simply enjoy your yummy home cooked meal! 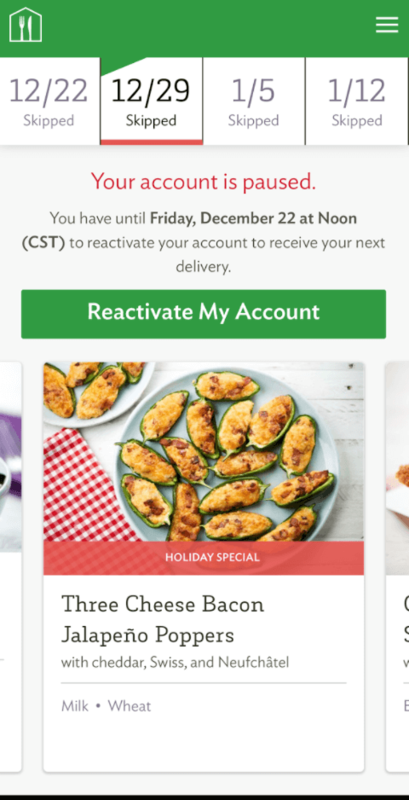 With Home Chef you also get the flexibility to skip weeks whenever you need, and you can change your recipe selections as often as you wish prior to delivery. You can cancel the subscription at any time. You can order what you want, when you want it – there are no daunting commitments with Home Chef. The Home Chef menu allows you to plan five weeks ahead, so if you like being organised you can certainly make your selections well in advance! 12 dinner options are available each week, including three vegetarian dishes for the veggie lovers. Home Chef also offer three lunch options that require no cooking. These include a range of selections such as salads, sandwiches and grain bowls. 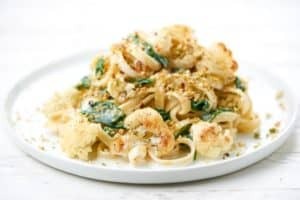 With Home Chef you will find dishes that are both classic and familiar but most of them involve new flavors or include a twist of some sort. See more actual Home Chef recipes reviews from our editor. What’s great about the Home Chef box is that everything is beautifully labeled and organized inside. You will always know which ingredients go with each dish and there is minimum sorting required. The proteins that require refrigeration are placed at the bottom of the box with an appropriate amount of ice packs. This means that the boxes can stay outside for a few hours without requiring refrigeration. 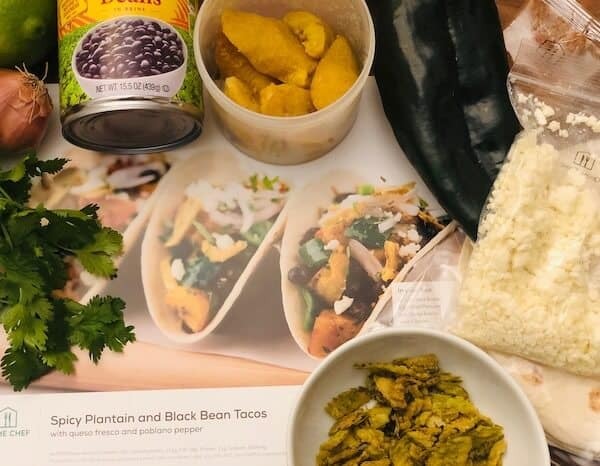 Every time we got a box from Home Chef, we are always impressed by the quality of ingredients that were supplied. When we investigated it, we understood why the quality is so good. Home Chef have partnered with many farms to deliver a high-quality supply of ingredients. Some of these include Paysan Breton Butter, Worldwide Farms for farm fresh herbs and vegetables and Sea to Table for sustainably sourced seafood. Home Chef have a well-organized and very easy to use website and app. Everything you need to manage your account can be done online. Starting from registering, selecting your plan and weekly meals, specifying your eating preferences, changing your payment method and updating other personal information. 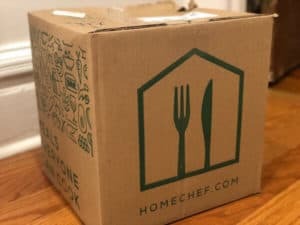 Our team made some changes to their order with Home Chef’s app and it was very easy to do. You can also find all the information regarding each dish on both the website and app. This includes information such as a list of ingredients, nutritional facts, cooking processes, cooking times and wonderful pictures as well! 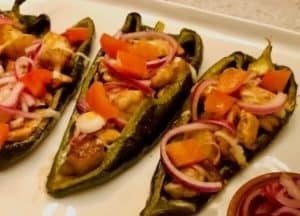 We love Home Chef! Their food is great. It is delicious classic cooking with an edge, and it is not too complicated to cook. So, whether you are a newbie in the kitchen and want to learn some new cooking tricks without getting lost in the process, or if you love cooking but got bored from the same meals you cook over and over again – Home Chef is the right choice for you!